New cross-border operating alternatives in the international arena are emerging, as times change and the global balance of power shifts towards Asian markets. One option to preserve trans-border networks for airlines is to replicate the prolific Asian LCC JV networks that allow multiple licences in individual jurisdictions while maintaining a common brand. This is no easy solution, is not guaranteed and introduces challenges. But, as the major EU LCCs review their options in the new environment, there is little doubt that the biggest losers if the UK were excluded from the single aviation market would not be the UK or the EU; those who suffer most will be Europe's consumers and regional economies. The prospects for a continuation of the single market are good, yet the world is changing fast as Asia's airlines and investors and their governments increasingly gain a voice in shaping the future. For every step backwards that Europe - previously a leader in liberalisation - takes, so the Asian aviation influence accelerates. Mostly this is progressing in a more liberal direction, where Europe's likely course now is regressive. The outcome of the 23-Jun-2016 referendum was immediately followed by statements from IAG and easyJet. IAG, the owner of British Airways, issued a profit warning, but said it did not expect Brexit to cause a long-term material impact on its business. The profit warning reflects weak performance up to the referendum and alludes to what will likely be a depressed few months or remainder of the year as uncertainty restricts business activity and the pound, causing a drop in outbound travel while making BA's cost base higher. Like IAG, easyJet also said it did not expect the referendum to have a long term impact on its business. easyJet's statement was longer and mostly devoted to it working to secure post-Brexit the aeropolitical access that has allowed it to flourish as the UK's largest airline and Europe's second largest LCC. It subsequently (on 27-Jun-2016) issued a profit warning based on disruption resulting from poor weather and ATC strikes as well as the impact on demand of the Egyptair tragedy; also mentioning the additional uncertainty from the EU referendum in the UK. easyJet's first statement (on 24-Jun-2016), below, said the airline wanted the UK to remain part of the single EU aviation market but that there are "alternative options" being developed if single market access is not guaranteed. "easyJet has been preparing for this eventuality in the lead up to the referendum vote and has been working on a number of options that will allow it to continue flying in all of its markets. "easyJet’s initial focus will be to accelerate discussions with UK and EU governments and regulators to ensure that the UK remains part of the single EU aviation market. This would enable EU airlines to fly freely within the UK and between the UK and EU, allow UK airlines to fly freely across Europe and would ensure that consumers continue to benefit from low fares and would mean easyJet and other airlines can continue to operate as they do now. easyJet will also continue to develop its alternative options that will fully maintain its existing network and operations." The ability, as enshrined in the single market, for UK-registered easyJet to fly routes that do not touch the UK is significant. 43% of easyJet flights in the week commencing 26-Jun-2016 are not to or from the UK. This metric is for flights, and not ASKs, which would take into account length of haul but does not necessarily correlate to revenue (longer flights tend to have lower yields as a result of fixed costs being spread over a longer distance). Single market access has allowed easyJet to fly wholly domestic routes in three countries: France, Italy and Portugal. 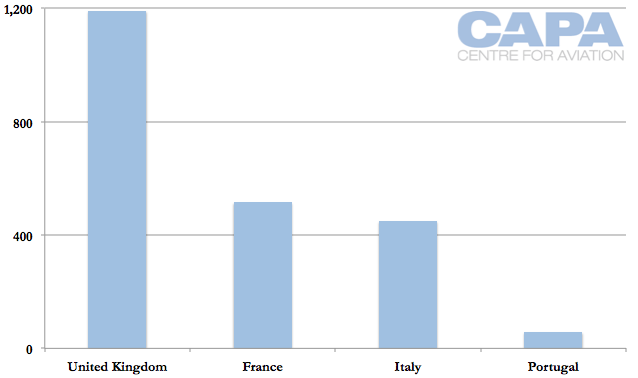 These three continental European domestic markets comprise 8% of easyJet's flights while domestic UK is 10%. For Ryanair, only approximately 1.5% of its flights – approximately 29 a day – are domestic UK services. 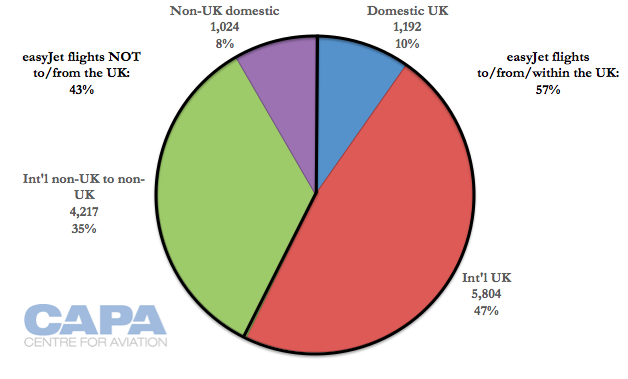 35% of Ryanair's flights are to/from/within the UK. The single market was to become more important, with negotiations to add further members outside the EU and some entirely outside Europe. 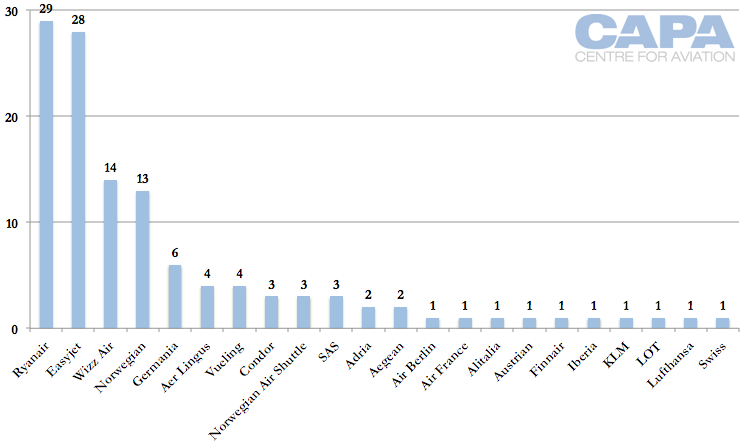 Morocco, for example, had been previously added, and created another market for LCCs to serve from multiple European countries but on a single AOC. 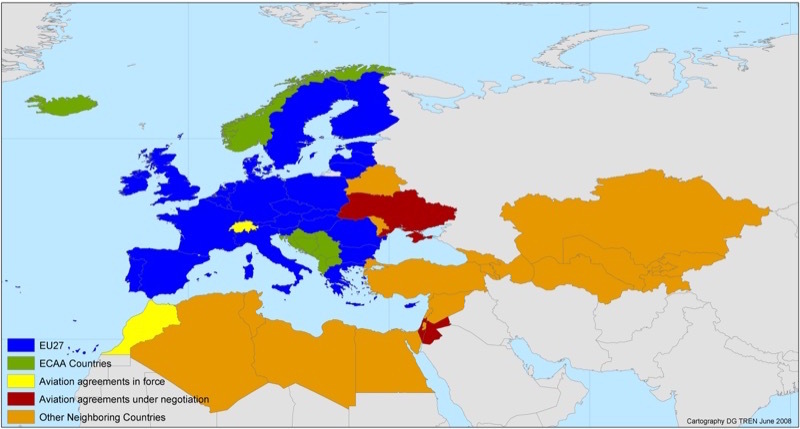 The EU says the European Common Aviation Area "could encompass up to 50-55 states with a total population of up to 1 billion inhabitants". As observed in Part 1 of this report, the UK's aeropolitical relationship with the EU after its exit is uncertain. easyJet sensibly wants the status quo to be effectively maintained - and cleared of any uncertainty as soon as possible. IATA in a 24-Jun-2016 policy briefing outlined the varying relationships and their impacts. Aeropolitical affairs also encompasses how the UK could participate in EU-US open skies and other agreements. These were covered in CAPA's Jan-2016 report referred to above. For the UK to maintain single market access would require it to adhere to associated regulations, from safety to noise to consumer protection. Yet because the UK would no longer be part of the EU, it would have very limited capability to shape that policy. This is ironic given Brexit's supposed goal to give the UK more independence from the EU. Then again, there is no clear post-Brexit plan from the "Leave" side on significant issues, let alone comparatively smaller ones like aviation. There is further uncertainty with talk of Scotland remaining in the EU. So, while there are forces for retaining a system that very much resembles the existing single market formulation, nothing can be taken for granted. Probably most sensibly and to the wider economic and social benefit, single market access will be maintained for the UK. But there are no guarantees. A worst case scenario could involve the UK having to establish bilateral agreements with individual EU countries. In this extreme (and hopefully improbable) scenario, it is unlikely that airlines will be able to have AOCs operating freely in multiple jurisdictions. A German-registered airline could fly within the single market and to the UK, but not within the UK or from France to the UK. A UK-registered airline could fly from the UK to other countries, but not between the other countries. The impact would be most negative for low cost airlines. Full service airlines might even benefit from rescinded LCC operations. Europe's flag airlines – Air France, KLM, Lufthansa and others – only fly to the UK from their home markets, despite being allowed to fly to the UK from other common market countries. A few full service airlines fly to the UK from multiple countries: two each for Adria and Aegean, for example, three for SAS and four for Aer Lingus. It is the short haul LCCs that have exercised their rights more actively in the common market: Ireland-registered Ryanair flies to the UK from 29 countries. easyJet links the UK with 28 countries; Wizz and Norwegian 14 and 13, respectively. Vueling, a Spanish-registered hybrid airline owned by IAG, flies to the UK from four countries. A restrictive aeropolitical environment depriving airlines of common market access could in the extreme mean that airlines – mostly LCC – establish affiliated airlines in local jurisdictions to be able to access local traffic rights. This would preserve much of their access as today but with higher costs and complexity. It would want to be avoided unless necessary. The most prolific of such cross-border JV networks can be found in Asia, mostly with AirAsia but also Jetstar and Lion Air, and to some extent VietJet and Tigerair. These JV networks were established to have a pan-Asian presence without the aeropolitical environment akin, or close, to Europe's single market. ASEAN open skies, which in theory features many elements of the European single market, is still a significant time off from being fully effective. Asia is not the only practitioner. In Latin America the Viva group of LCCs emerged, while a more conspicuous example is with the continent's full service airlines, where LAN (now LATAM), Avianca and TACA had JVs in other countries that share the parent's branding. Indeed, even in Europe there have been a few sister LCCs but with limited impact. easyJet has easyJet Switzerland while Wizz Air – until 2015 – had Wizz Air Ukraine, and previously had Wizz Air Bulgaria. In a most restrictive aeropolitical scenario, it seems that easyJet could have an EU operation as well as a UK operation in order to preserve its network as it stands today. But for many markets it could be advantageous to have a local EU airline fly to the UK, if the UK airline is excluded from maintaining its current market access. For example, Spain is easyJet's largest market from the UK. Having a Spain-registered airline fly some frequencies could help reduce any overnight costs of the UK operation (although easyJet's existing model largely avoids these costs by returning aircraft and crew to their home base), allow for lower cost Spanish labour to be used, or a number of reasons. Spain accounts for 27% (783 weekly one-way) flights of easyJet's international UK network while its five largest markets account for 66% of UK flights, and the 10 largest markets account for 88%. Seven of easyJet's markets from the UK do not have more than two flights a day on average, while thirteen markets do not have more than four flights a day. Establishing a separate airline in such markets would be challenged to bring benefits that outweigh the costs of the separate licence. These smaller markets could be leveraged when negotiating access; easyJet's exit may not prompt another competitor to enter. It is difficult, near impossible, to see why a proliferation of AOCs through individual JVs would be preferable to maintaining single market access. As such, this report assumes LCC JVs are created because single market access cannot be secured. This would likely be the result of acrimony and a rejection purposefully made to limit competition. In such a situation countries may not support a JV network. At the most introductory point this could prevent the establishment of new airlines, thereby precluding a JV network entirely. Although European (and American counterparts) were unable to stop the establishment of new airlines affiliated with Norwegian Air Shuttle, they have worked to limit its designation and ability to compete. The Asian LCC JV model has most publicly run aground in Hong Kong, where the city rejected Jetstar Hong Kong. But Incheon Tiger Airways, a proposed Seoul-based JV of the Singapore Tiger (now Tigerair) Group, was rejected on the formal grounds that effective control did not reside in Korea, although the real reason for its prohibition was to preclude new competition. Since then, Korea – and some other – markets have made clear to LCCs that they will not accept applications. Asia's liberalisation is entirely different from that of Europe, of course, and remains nationalistic, but the general direction, aided by the obvious socio-economic benefits, has been to relax barriers. In an unwelcome EU scenario of this type, if JV LCCs are established, regulators could query effective ownership and control in order to limit competitive activity; the EU is currently reviewing Delta's stake in Virgin Atlantic, as well as Etihad's in airberlin. From a regulatory point of view, ownership is relatively straightforward and is a matter of tracing shares. Effective control is more difficult to prove, when challenged. International airline operations generally require local ownership and control, and in Asia the latter can be treated relatively casually, provided safety oversight is adequate. Cross-border subsidiaries have so far had little trouble persuading authorities that local ownership can equate to local control, even if foreign subsidiaries are not entirely autonomous, depend heavily on the foreign airline and the local owner is a silent shareholder. In practical terms, the difference has come down to a presumption of local control unless there is strong opposition; in the case of Hong Kong, the presumption effectively became one of foreign control. One actively seeks competition and erosion of archaic economic regulation, the other seeks to protect incumbents. The reasons for needing at least some foreign control are a result of the internal challenges of managing a group of JVs. A liberal presumption can actually accelerate the potential for more formal and wider openness - so that AirAsia founder Tony Fernandes in Jun-2016 was able to reiterate his desire for a single AirAsia if the regulatory environment allowed: "Investors believe in the future of AirAsia as we move towards hopefully a single listed vehicle," Mr Fernandes tweeted, later saying, "The vision of one AirAsia is closer". Within the European LCC JVs there would inevitably be overlap: the UK-based airline, for example, would not want all UK-France flying carried out exclusively by a France-based partner, or vice versa. 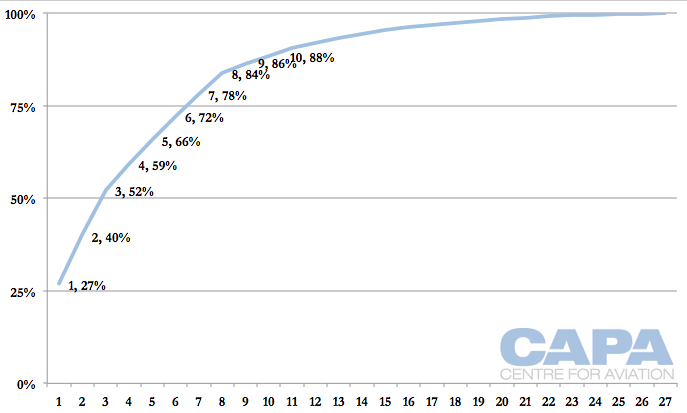 Sharing the market – capacity, timings, yield management – is not complex. Each JV has its own shareholders to report to. Their interest is the best outcome for their business and not another sister LCC in which they hold a minority, or no, exposure. Thus Thai AirAsia may not want to develop in the same way as Indonesia AirAsia wants could be replicated between a European LCC's UK and German units, for example. Europe's LCCs are considering adding complexity to their business model: connections and outside partnerships, for example. Not all owners of the JVs may agree on this worth, or make the inventory available, or tweak schedules to facilitate the implementation. A connecting itinerary favourable overall to the group may not sit well with individual shareholders – as seen in the case of Tigerair and Scoot, which led to Singapore Airlines buying out Tigerair's other shareholders (Singapore Airlines has a 100% stake in Scoot). Tigerair has since begun participating in SIA Group network planning meetings but any decisions that involve Tigerair are not binding. Tigerair’s independent board members still must agree that any suggested route changes are also in the interest of its minority shareholders. This not an easy sell as the minority shareholders are not exactly the happiest bunch, having seen Tigerair’s stock price drop by 80% over the last five years as a hoped for takeover by SIA never materialised. Only a Scoot-Tigerair merger can fully resolve this weakness, a fact Tigerair’s minority shareholders may be keen to leverage. A merger would clearly provide improved flexibility to better match capacity with demand. But some suggested adjustments would be positive for Scoot and the overall SIA Group but negative for Tigerair. Under the current structure such adjustments are nearly impossible to implement – even if the additional profit for Scoot easily outweighs the resulting loss for Tigerair. For example transferring a profitable peak hour flight from Hong Kong, where slots are scarce, would generate more profits overall as Scoot’s much larger aircraft is a better use of the slot. But Tigerair would struggle to find an alternative flight that would generate the same level of profit. Malaysian short haul LCC AirAsia has refused to hand Hong Kong flights to long haul sister AirAsia X, which has a different ownership structure, for the same reason. The chances are probably small that European airlines will need to create JVs to attempt to preserve existing networks in a situation where the UK cannot retain single market access. The UK remaining in the single market would surely generate the best outcome for Europe – airlines, airports, aviation ecosystems, the population etc. – as a whole. Without single market access, some specific airports and airlines may be able to improve their position compared with today, but Europe on the whole will be poorer. A single market that can accommodate such a large (economic and aviation) power as the UK on different terms brings optimism to current and future blocs that organisation does not have to be rigid to produce benefits. In this unfortunate exercise there is the opportunity not only to find new approaches and to innovate to solve a crisis, but also for those solutions to be a lesson. Nonetheless, the loss of the UK's (mostly) liberal counterbalance to the conservative and protectionist voices of Germany and France will be a severe blow to hopes of Europe continuing to lead the changes to market access regimes. Negotiation of parallel agreements, where the EU establishes bloc-to-bloc liberalisation, will become tinged with more restrictive thinking. Among the many ironies of the current situation, the EU is in the throes of negotiating a multilateral agreement with the countries of ASEAN, where most of the LCCs and cross-border JVs have arisen. The UK has been a strong supportive presence in those discussions, but risks now losing its voice. Perhaps there can be mutual lessons to be learned from their respective regulatory histories. Within the next decade, Asian market practices will pervade the global system more widely as the region's airlines spread their wings and their investors engage increasingly in Europe.